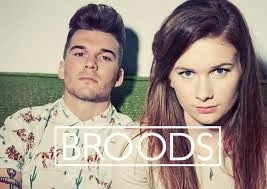 Broods are the latest name to take note of from the small island nation of New Zealand. If you haven’t been hearing much coming from the land (near the land) down under, you’re simply not paying attention. The brother/sister duo (made up of Georgia and Caleb Nott) are from the capital city Auckland, and the dynamic duo is one to watch. With only one song out, the twosome has already made quite the name for themselves. “Bridges”, their debut single, has garnered hundreds of thousands of plays across various Youtube videos and their Soundcloud...and it has only been out for a month. Critics have jumped at the chance to praise them, and just the other day they officially signed a major label deal. Georgia and Caleb have had help in crafting their beautiful opener: Joel Little, producer of a little song called “Royals” by some girl named Lorde. Little is responsible for “smoothing out” the lush production and mastering the whispering vocals that make “Bridges” such an immediate standout track. He is also working with the band on their upcoming EP, so expect more mastery from these three.